People notice things like how popular blackjack is and it's not surprising that it's just as popular in online casinos. Learning how to play online blackjack is easy enough with a decent guide, which this article sets out to provide. When playing blackjack online, it becomes apparent that the rules and strategies are (in most cases) exactly the same as they are in brick and mortar casinos. This makes it an easy transition if you are already used to playing in real world casinos and it also makes for an easy learning curve even if you're new to the game. There are some very basic rules that you will need to know about before you start playing blackjack online, so let's start with the value of the cards before all else. Ace: Counts as 1 or 11, which you choose depending on how it best fits your hand. The score in your hand is simply the sum total of the cards you hold. The object of the game is to score the highest hand you can without exceeding 21 points. Regardless of how many other players there are around the table, your main objective is to have a higher score than the dealer to win. You start the game by placing your bet before a single card is dealt. The dealer then deals you two cards face up unless you are playing a face-down game, in which case they will be face down. The dealer also deals himself two cards, with the first one face up, the second face down. At this point you may make certain decisions. The first is whether you want to surrender (stack your hand for a 50% loss of your stake) or continue play. The next set of options are to stand (accept no further cards because you have a high points total), hit (accept another card if your points total is low) or split (if you have a matching points pair, such as two 8s or two aces, for example). With regards to betting, you also may decide if you wish to double down. This means increasing the size of your initial stake up to a maximum of the value of that stake. So if you initially bet $10 and you have a hand that you believe could win, you may increase your stake up to a further $10 (total $20) at this point. If you split a pair, you add a second stake and play as it you had two separate hands. The dealer deals one more card onto each of the pair you just divided. Some casinos allow you to double after split, so you can double each stake, although there is usually a limit to the number of times you can split and double down. Once your bet(s) are adjusted and you have decided to stand after hitting assuming you didn't "bust" (exceed a hand total of 21 points), the dealer reveals his hole card. Most casinos have a strict dealer rule that he must stand on 17. That means he will continue to hit until his points total is 17 or more. An ace always counts as 11 as long as the dealer doesn't bust (for example ace, 7 would total 18 and he would stand and pay hands of 19 or better). If his total including an ace is only 16 (Ace, 5) he would hit until his points totalled 17 or more and then stand. With a "dealer hits soft 17" rule (a points total of 17 including an ace), the dealer must hit until his points total reaches soft 18 or better, or hard 17 (no ace) or better. This rule increases the house edge slightly. To win, you literally must beat the dealer's hand with your points total. Exceptions are when you and the dealer have "blackjack" which is a points total of 21 on your initial two cards. In that case, the game is a "push" or tie and your stake is returned to you. If you score 21 with 3 cards, that's not considered "blackjack", just 21. There is a great importance in this distinction. If the dealer scores 21 with two cards and you total 21 points with 3 or more cards, you lose. If you have blackjack and the dealer accumulates 21 points with 3 or more cards, you win. The winning odds are 1:1 (you bet $10 and win $10 while retaining your original stake) except where you have blackjack, where the winning odds increase to 3:2 (you bet $10 and win $15). There has been a lot of publicity over the technique known as "card counting" to gain an edge over the house and potentially increase your winning chances. Movies such as "21" highlighted the true story of a group of MIT students that in the 1990s used this technique coupled with a group strategy to beat Las Vegas casinos to the tune of several million dollars. However, individuals counting cards in casinos are monitored closely by security and routinely ejected. 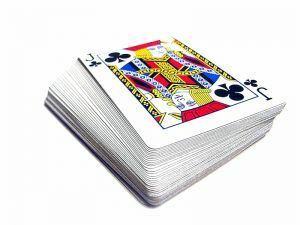 In an online situation, this technique has no value as the decks are constantly randomized to prevent counting having any bearing on the outcome of each deal. Thus the real strategy can only be experience in knowing when to increase your bet (doubling) and on which hands to hit or stand. It is worth taking notice of how the dealer is forced to stand on 17, but to hit 16 or less. The casino knows that this is the optimum strategy for long term winning, so if you want to have the best chance of success, you might consider mimicking this strategy for hitting and standing. As for splitting, you should generally split a pair of 8s or lower and always split aces. Why? A pair of 8s will give you 16 and the dealer is going to aim for 17, better or bust. This means standing on 16 is a bad bet in any case, so if you have a pair of 8s. it is a golden opportunity to increase your winning chances. With a pair of aces, you increase your chances of getting blackjack on one or both hands, thereby virtually guaranteeing a win (as there will only be two more aces in the deck, lowering the odds of the dealer also having blackjack). Surrendering is seen as ultimately bad play over time. This is because to surrender a hand, ignoring pushes it must only be 25% likely to win. So if you win only 25% of the time, it turns out your net loss on a 50% stake loss is 50% of all your bets. That actually equals what you'll lose by surrendering, meaning you miss out on the chances of better wins, especially when the dealer is statistically going to bust some of the time. The last thing I want to mention is an "Insurance" bet. This is offered when the dealer shows an ace on his upturned card, signalling the higher chance of his having blackjack. The insurance bet is offered to cover this eventuality and pays out at 2:1 if the dealer does indeed turn over a 10 point hole card for blackjack. You will still lose your initial bet unless you also have blackjack (where your bet is returned), but the insurance bet win covers that loss. In most cases, an insurance bet is not a good one and should generally be avoided in online casinos where card counting has no effect. So that's the basic rules and strategies of playing blackjack at an online casino whether you are playing on a full size home computer or on your phone at a mobile casino. You will notice that with the exception of the ability to count cards as in a real casino, the strategies and rules are virtually the same. It is just as popular and exciting to play online as it is in a real casino situation and you should enjoy it just as much.